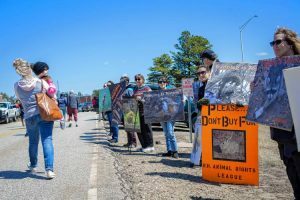 New Hampshire Animal Rights league, Inc. - PROTEST FUR - New Hampshire Animal Rights league, Inc. This is the trapping table at the NH Fish and Game’s Discover Wild NH Day. 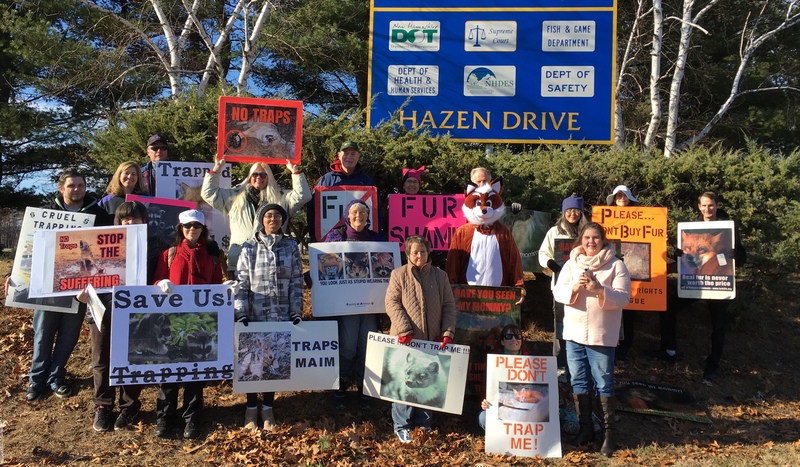 At the same time they were promoting the torture and killing of innocent animals the NH Citizens Against Recreational Trapping and the NH Animal Rights League were right outside the event protesting the torture and killing. It was a huge and successful protest, one of our largest ever. Please join New Hampshire Animal Rights League as we rally against the selling of fur on the sidewalk outside of the Mall of NH in Manchester, NH, December 16 from 11AM until 1PM. We will be urging holiday shoppers to not buy fur. 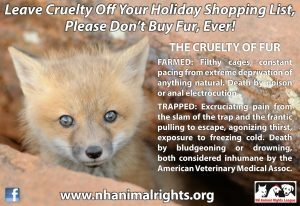 Stores in the New Hampshire Mall sell fur trim and accessories (bad enough) but Macy’s is the biggest retailer of fur. 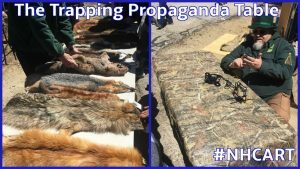 In many of its stores in larger cities Macy’s has fur salons that sell full length fur coats made of hundreds of minks and chinchillas to name a few of the animals that suffer and die for this unnecessary luxury product. Meet: At the entrance to The Mall of New Hampshire on South Willow Street. Park in the lots closest to the entrance and walk up the hill to the side walk. All materials will be provided but feel free to bring your own awesome sign. 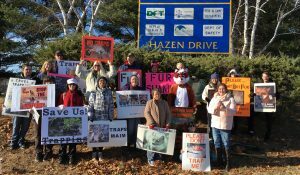 Please write the Miss NH Board Members to express how you feel about them accepting a cruel gift of a fur coat from the NH Trapper’s Assoc. 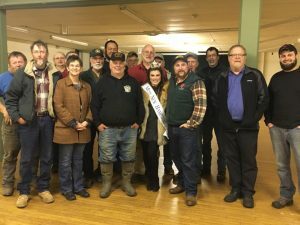 This is a picture of Miss NH wearing the coat with some of the trappers. Please do not write or comment on the young contestant. The fault lies with the pageant organizers! 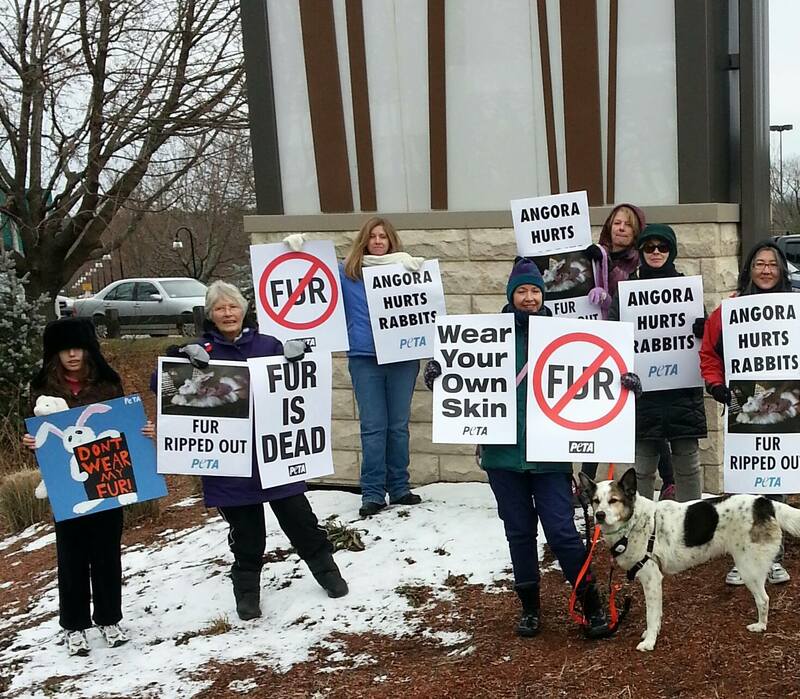 It is up to them to stop accepting fur.